V8 Supercars has announced the 2016 pit lane order today, with Mark Winterbottom and Chaz Mostert split across separate garages this season. After winning last year’s teams championship, Red Bull Racing Australia retains the number one garage, with its third TeamVortex car sharing with customer TEKNO in the second. Prodrive Racing Australia takes garages three and four, though champion Wintebottom will share with a soon to be announced driver and Mostert is racing under the Rod Nash Racing licence, to share a boom with Super Black Racing’s Chris Pither. Prodrive stated commercial reasons dictated the split, with sponsors on the #6 Ford Falcon FG X to be announced, while Mostert switches to Supercheap Auto sponsored #55 for the 2016 season. This means the costly pit lane double stack may not be an issue for championship contenders Winterbottom and Mostert. The two cars in one garage share a boom and in the past teammates have suffered from stacking, with Craig Lowndes and Jamie Whincup arguably the most affected. 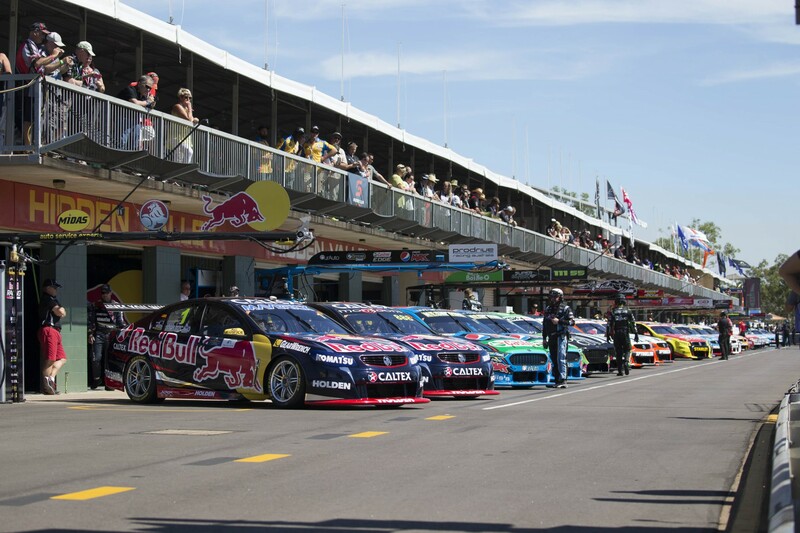 While those two no longer share, new pairings placing Whincup with Shane van Gisbergen and Lowndes with Will Davison mean both garages will need to be mindful of stacking and pit stop strategy. The Holden Racing Team duo of Garth Tander and James Courtney take the following garage, with Brad Jones Racing’s Jason Bright and Tim Slade next in line. BJR’s third driver Tim Blanchard shares a garage with newly established Team 18, as Charlie Schwerkolt starts from scratch with driver Lee Holdsworth this season. Next in the order is Nissan Motorsport, with the Kelly brothers’ entries sharing ahead of Michael Caruso and Dale Wood. Wilson Security GRM follows with Scott McLaughlin and newcomer James Moffat. Expanding to two cars, DJR Team Penske sits next in the order. Given pit order is calculated by each team’s championship points from the previous year, points earned by the Marcos Ambrose/Scott Pye DJRTP entry are combined with those banked by Super Black Racing, which ran a REC (Racing Entitlements Contract, licence to compete) leased from DJRTP. Lucas Dumbrell Motorsport follows with Nick Percat and a yet to be announced driver, with new-look Erebus Motorsport filling the final garage with David Reynolds and Aaren Russell suiting up for the squad this year. Positions are determined from points earned in the team’s championship the previous year, with points allocated to each REC. Teams that operate as groups sit together in pit lane – as is the case with four-car squads Prodrive and Nissan. Those with three cars pair with single cars – like TeamVortex and TEKNO, and BJR and Team 18 – pair and combine personnel for pit stops.